The METOLIGHT LED tube VDE-RM is significantly brighter than conventional fluorescent tube 150 cm / 58 Watt - T8 - saves about 80% energy at about 10 times longer durability. The clear shell ensures brightest lighting in light beam angle of about 120°. The optimal mounting height is from 4-8 m.
Rewiring of the luminaire or even remove the existing magnetic ballasts is not necessary. 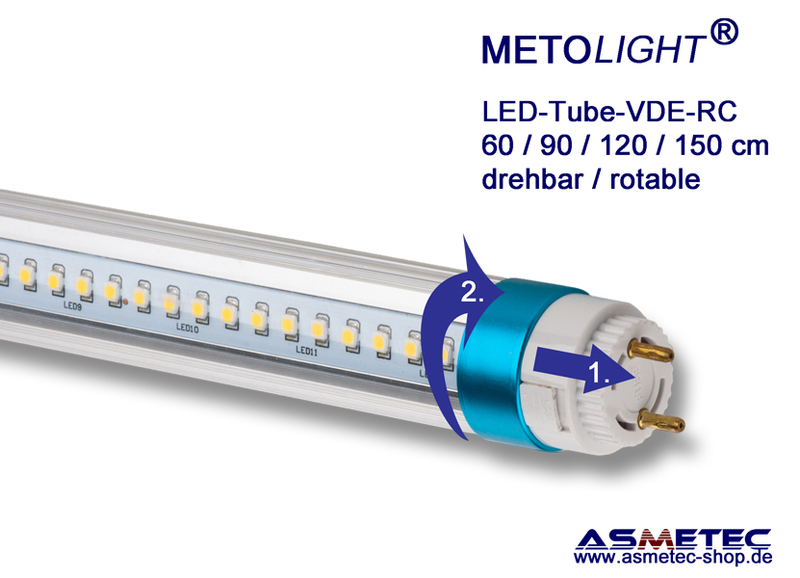 The METOLIGHT-VDE-RC works on all conventional magnetic ballasts as well directly to 230V AC. You only need to replace the existing starter by the special fused LED-starter supplied with each tube. (Asmetec item -no.101495). However luminires with tandem circuit (1 ballast drives 2 tubes) must be checked before. Here it may be that the tube does not light up. This LED-tube in light colour 5800-6500K - cold white is ideal for use in warehouses, hallways, car park, indirect lighting etc. Mounted in IP65 luminaires it also can be used outdoor or in fridge rooms. It cannot be used with dimmers and with electronic ballasts.